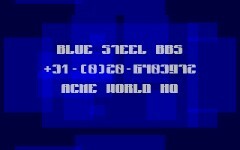 and NO, this is NOT the same as the "blue steel" demo that is already added here. It comes with the other Blue Steel. :) Nice for 5kb. Screws up in some vers of DOSBox but okay in -X.
page created in 0.014007 seconds with 16 queries.